Do your nerves drive you crazy sometimes? Is your stomach bothering you on occasions? Could your muscles use some help relaxing after a long workout? Origanum Majorana or Marjoram, as it is most commonly referred to, is a perennial herb which derives from the Middle Eastern countries. That’s an under shrub which is characterized with its citrus herbaceous flavors as well as its sweet pine sensation. When it comes to the healing capacities of the oil which is derived through steam distillation of the leaves, they are known to be plentiful. The oil may help you with your nervous, cardiovascular and digestive system and it could provide a range of other benefits. ​Click here to see our Ultimate Guide to Using Essential Oils! It has particularly calming properties and could have a positive effect on your nervous system. It may support proper functioning of your immune system when digested. It may promote healthy condition of your cardiovascular system. Diffuse a few drops of Marjoram at night and feel a wave of calm come over your body. You’ll be relaxed and ready to drift off to sleep. 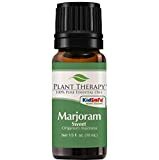 Use Marjoram Sweet to help with snoring. Marjoram Sweet is calming, comforting and warming. Marjoram essential oil could be used in all of the three methods. This is going to provide you with a chance to take advantage of isolated benefits and hence help you can target different problems. Of course, if you want to channel all of the advantages at once, there is nothing wrong with combining different application methods. Aromatic Use: When diffused, the oil might help calm your nerves and it might have an overly positive effect on your entire nervous system. Topical Use: Dilute a few drops of the oil on dense muscle groups after a hard workout. This will help you recover quicker and hence achieve better results at the gym. Internal Use: Whenever you are using dried marjoram in your cooking recipes, replace it with a few drops of the oil for more focused scent, aroma and taste. Different uses of the oil pose different advantages. However, it’s also worth noting that you need to be well aware how to use the oil appropriately. If you want to diffuse it, you should make sure that you don’t use more than three or four drops in the commercially bought diffuser. On the other hand, if you are going to be using it topically, make sure to apply only a drop or two and it’s appropriate to use carrier oil to avoid irritations. Internal usage could be beneficial if you dilute one drop in an approximation of 4 fl. oz. of liquid of your choice. These are the recommended quantities that you should be aware of. It is highly valued for the fact that it may have particularly positive effect on your overall nervous system. The best way to emphasize on it is through comprehensive and relaxing aroma therapy. Furthermore, you can add the essential oil to a soothing blend for your massage. With the resulting liquid you might want to target muscles which are overly stressed or tired for quicker recovery. The oil might promote healthy functioning of your cardiovascular as well as immune system. This is particularly important. You can substitute it for dried marjoram the next time you decide to prepare a delicious meal. This is going to give the dish a more focused and centric taste. You can apply it to your muscles before as well as after a workout and this may help you achieve a lot quicker recovery. This may help achieve better results. It is known for its calming properties so you may apply it to the feet of your kid prior to putting him or her to rest. The first thing that you need to know about the essential oil is that it comes from the leaves of the marjoram herb after being run through steam distillation process. The herb itself is indigenous to the countries of the Middle East and it comes with a lot of different names, some of which are more familiar than others. However, it’s important to know that the plant itself has quite a lot of beneficial properties and that’s why it’s used as a dried herb. The essential oil, on the other hand, manages to channel these properties in a far more prominent way. Therefore, if you are using dried marjoram for something, you can easily substitute it for the essential oil if you want to achieve the same benefits but more channeled. Of course, it’s also important to understand that the FDA is yet to approve the oil for its healing properties. Even though there are many people who are reportedly content with its functioning, science has some catching up to do. It may induce significant health benefits as a result of prolonged usage. Starting with the more integral ones, aromatherapies with the oil may significantly calm your nerves and improve the functioning of your overall nervous system. At the same time, if you decide to apply the oil topically, you may experience amazing muscle relaxation benefits. This could help you recover quicker after a workout session; hence stimulate muscle growth and proper training. At the same time, the oil can substitute dried marjoram in a range of different cooking recipes. This is going to provide you with the same sensation but only more dense, centric and focused. Last but not least, it is known for the prominent relaxation properties that it has. That’s why you may want to rub it to a fussy child’s feet right before his or her nap. Of course, as it is with every substance, you should exercise general care and precautions when using marjoram essential oil. Despite the fact that it’s entirely natural and there are no chemicals involved in the production of the oil, if overused it could cause issues. This is why you should make sure that you do not use more than a drop in 4 fl. oz of liquid when consumed. Use carrier oil when applying it directly to your skin. Diffuse no more than four drops of it at a time. Furthermore, if you are undergoing any special treatments or you are currently pregnant, it’s absolutely mandatory to contact your treating physician before you even decide to use the oil. Keep it away from kids and from sensitive skin areas. It can be used alongside nerve-relaxing medications. The best approach would be to diffuse up to four drops in your commercially bought diffuser at home, in your car or in the office. This can help with stimulating the proper functioning of your overall nervous system. You can also add it to your everyday nutrition supplements. This may induce benefits to your digestive system. If you are using any topical solutions for muscle relaxation after hard workouts, you can also substitute those for the oil. It may bring prominent advantages in this particular direction. It blends well with roman chamomile, clary sage, cypress, lavender, myrtle, rosemary as well as all other citrus oils. Blending marjoram oil with other essences is going to induce concentrated range of benefits. This essential oil without a doubt brings convenient benefits. It is versatile in that you can diffuse, dilute, and apply it topically. This is going to provide you with many potential advantages. Of course, you should also be aware of the fact that there are certain precautions to keep in mind. However, if you exercise reasonable care everything should be just fine. Now, even though the production of the essential oil has been around for centuries and the healing capacities that it has have been reported by countless people, the FDA is yet to approve the substance. Science has yet to catch up with backing up the claims and that’s why it is particularly important not to substitute any medicinally prescribed drugs for the oil.